Norway’s largest bank DNB ASA, simply known as DNB, introduced a new feature on its app called Vipps, which enables anyone in the country to pay businesses with credit cards or bank accounts. The app, which operates like PayPal, can be used to send payments to anyone in the region by simply entering a mobile number, email address or a username. Norwegians can now purchase Bitcoin with credit or debit cards through Bitcoins Norway, without any excessive user verification and authentication. How to purchase Bitcoin in Norway? Bitcoins Norway, a prominent Norwegian Bitcoin exchange, has utilized the newly introduced feature of DNB’s Vipps to allow its customers to purchase Bitcoin through simple credit or debit card payments. 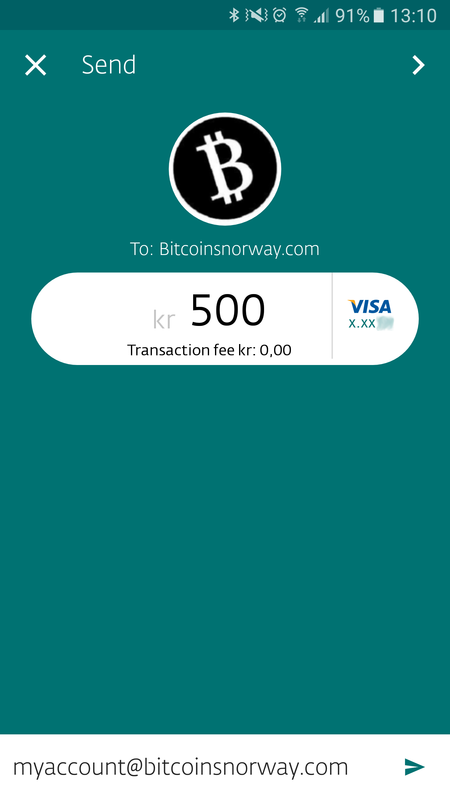 To purchase Bitcoin, users can send any amount of the Norwegian krone to myaccount@bitcoinsnorway.com after settling a Bitcoin purchase order. Using the Vipps application, users can immediately send a payment to the email address of Bitcoins Norway, which will then verify the payment and send Bitcoin to the customer’s Bitcoin address. A user of Bitcoins Norway, who recently was notified of Bitcoins Norway’s new service, released a screenshot of the user interface. In most countries, there exist over-the-counter (OTC) Bitcoin exchanges like Bitcoins Norway, that allow customers and users to purchase and sell Bitcoin without excessive user verification. Users can visit bank branches or remittance outlets to send or receive payments for Bitcoin. In the Philippines, a venture capital-backed startup called BuyBitcoin.ph offers a similar service, with which users can make deposits in a bank and claim Bitcoin through their Bitcoin address. Bitcoins Norway eliminates the need to visit physical locations of banks and remittance outlets and enables users to purchase and sell Bitcoin directly from their mobile phones. This service maximizes efficiency while optimizing user experience. The user, who reported on Bitcoins Norway’s newly introduced feature, also stated that Vipps had a lot of users, around 27 percent of the Norwegian population. According to various research data, Vipps remains the most dominant mobile app in the country to date, with 85 percent of Norwegians aware of the app and 25 percent of the entire population actively using the application. DNB also released on official market research paper on Vipps, which stated that 43 percent of Vipps customers are not DNB customers. That means, the largest bank of Norway has taken over the non-bank and underserved populations through their innovative mobile application.